Communication is a fundamental human right. Nevertheless, it is not granted to a part of the population that lives with severe disabilities as people suffering from ALS, cerebral palsy, brain damage and other conditions that leave a person’s body completely paralyzed, preventing them from communicating and accessing technology. 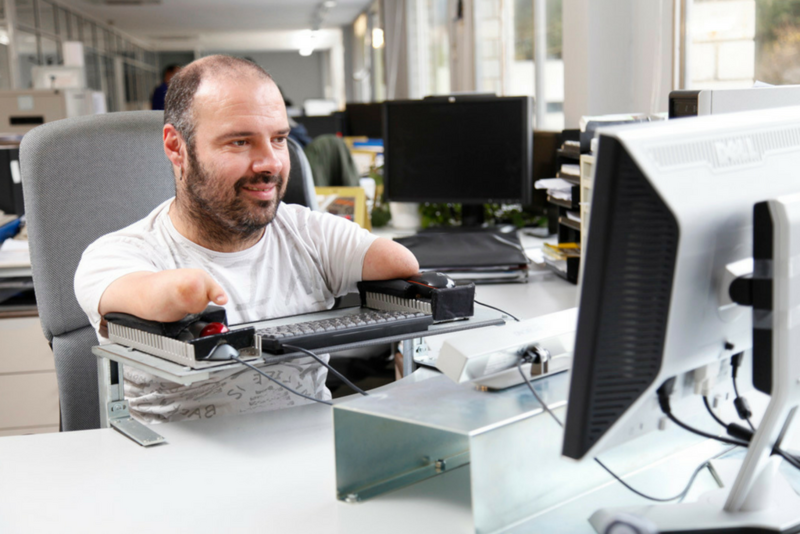 In order to address the issue and reduce barriers to communicate, Irisbond developed a hardware with eye-tracking system that allows people with reduced mobility to use computer (PC) and laptops. Thus, there is a need to bring that solution to the next level and make it more accessible. For that reason, Irisbond is working to develop eye-tracking embedded in mobile devices and make it accessible via webcam. Irisbond is one of the winners of the first d-LAB societal challenge Empowering people with disabilities through mobile technologies. Eye-tracking is a technology of the future. It is especially powerful if combined with other technologies, such as voice recognition, face recognition and face-tracking. Eye-tracking in mobile devices is a unique innovation and Irisbond is working to make it happen. Irisbond’s webcam eye tracker is an innovative system that allows the user to control the mouse cursor by the movement of their eyes, using only a standard webcam instead of additional devices. The system combines eye tracking and face tracking, so that users can make selections and navigate their smartphone or tablet naturally just with their eye gaze. Irisbond solution can make smartphones and tablets accessible to everyone, even those who have a complete locked-in syndrome and can only move their eyes. It will allow them to feel connected and useful, interact with their surroundings and feel alive. The project evaluated how eye-tracking technology enhances the communication of people with disabilities and facilitates them access to different tools through mobile devices, as for example, to social networks, in this case Twitter, empowering them in their daily lives. The pilot was implemented at the Institut Guttmann, a renowned neurorehabilitation hospital based in Barcelona, and tested by 7 patients and 6 health professionals during 4 weeks in order to assess Irisbond’s mobile phone webcam eye-tracker software that allows users to control the mouse cursor with the movement of their eyes. The pilot was successfully completed delivering promising results and getting closer to the commercial stage of the eye-tracking app – EyeTwitter – by launching a prototype available on Google Play. Moreover, a strong communication campaign was developed together with Twitter & McCann in Spain to raise awareness about this technology & solution. Under the title of #Imback (#hevuelto), the twitter campaign explained the experience of Alberto Moreno (Cáceres, 1995), a young quadriplegic who has once again been able to tweet after an accident in 2016. The campaign obtained more than 100 million impressions on Twitter and a conversation volume of more than 22,000 tweets. It also counted with the collaboration of Spanish celebrities like Antonio Banderas. Irisbond’s solution has a potential to improve dramatically the ability of people with highly reduced mobility to communicate with friends and family and give them access to the Internet. It will make them become more independent, included in the society and can have a positive impact on their self-esteem. They will be given the opportunity to access education and employment. At the same time, the solution can also improve the lives of citizens without disabilities, making the use of mobile devices more natural and intuitive for everyone. In the long term, we envision Irisbond to become a universal accessibility tool to access and control mobile devices. IRISBOND / TUITS A OJO from ETURA on Vimeo.